Rehabilitation of degraded lands in the Eastern Cape of South Africa using spekboom (Portulacaria afra) attracts large investments from government, primarily as part of a poverty alleviation scheme. Planting spekboom truncheons is simple manual labour for which the poorest of the poor in rural communities can obtain an income. The spin-off from the poverty-alleviation agenda is that landscapes severely degraded by domestic livestock may be returned back to a natural state. More information on this and the carbon credit potential of spekboom rehabilitation is available here. However, this particular post is focussed on the natural history of spekboom and how this relates to the current planting protocols. 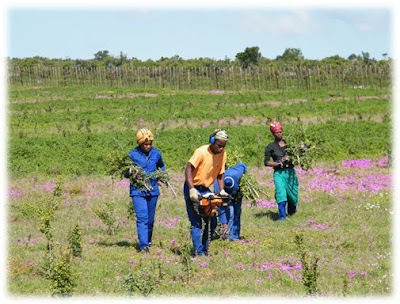 At present rehabilitation involves planting truncheons of spekboom, cut from the parent plant, into holes 10-30 cm deep. However, although spekboom can, and usually does, grow after such planting, it is a far cry from how such vegetative reproduction (i.e. not via seeds) would occur in a natural system. Although spekboom does flower prolifically, I suspect that recruitment via seeds is rare and only occurs under a series of uncommon favourable climatic events. I have yet to find an example in the field that I am convinced is a seedling; even single leaves can develop roots and most tiny plants I've come across look to have arisen from this trait. Nonetheless, vegetative recruitment predominates and without this trait, the rehabilitation project would be impossible. Yet, how and in what form do bits of spekboom get transported around the landscape? Although other animals may play a role, I believe that elephants were the major dispersal agent of spekboom in prehistoric times. Personal observations of their feeding behaviour are that elephants transport branches long distances from the parent plant, with a rain of small branchlets along the way. I have seen elephants break off branches of spekboom and walk on while munching the branch, much like a stick of candy floss. Unlike candy floss, the branch does not stick together and there is a rain of semi-chewed branches and branchlets. These then lie on the ground and some have the opportunity to take root and continue to grow (I have seen tiny spekboom plants taking root along small crevices on a barren rock-face). And I think this might be where the current protocol applied in the spekboom rehabilitation project may be getting it wrong. The protocol clips stems and with very little damage, and then plants the fairly large truncheon upright to quite a substantial depth in the soil. This all makes sense: larger truncheons should be able to survive longer and thus have a greater probability of establishment; truncheons planted deeper gives them greater rooting area; and, an upright plant just looks right (i.e. fits in with our preconceptions about plants). But is it right? Based on the idea that this species has evolved under a regime of megaherbivore browsing, and thus would be dispersed in the manner I described above, I predict that the use of large planted truncheons is not an optimal protocol for mass-propagation in natural landscapes. I recently had the opportunity to dig up a range of truncheons that were planted a number of years ago. Below is a truncheon that showed no signs of growth or herbivory, but was planted eight years ago. It looks to have been planted at 10 cm depth. There are no roots coming from the buried stem, only from the base where it was cut. I took time and care to excavate this plant, and only found roots at the base. Here is another individual that was planted about six years ago at another site, but was showing healthy signs of growth. The dotted line represents the soil surface from which this plant was dug. Only one root was found to be growing from the stem, and this was linked to clear damage (maybe knocked by a tool). Otherwise, all roots were found growing from the cut along the base, and these were growing upwards, obviously trying to obtain moisture from the near-surface layers. Photo credit: Alastair Potts. Additional credit: Careful excavation by Nicholas Galuszynski. 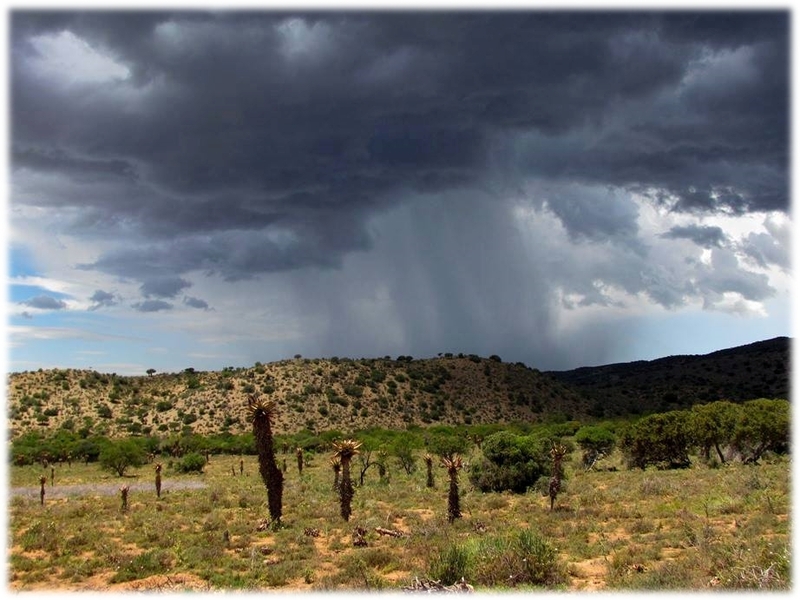 In the arid environments of the Eastern Cape, rainfall events are rare and not often soaking. Moisture is usually only available at shallow soil depths, and quickly evaporates. 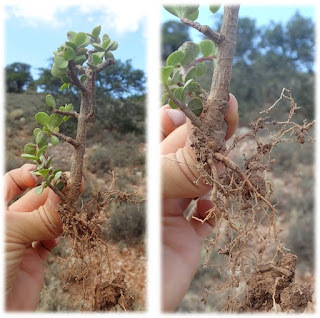 Most arid plants have extensive roots at shallow depths. A localised shower over a spekboom-denuded slope in the Baviaanskloof. By planting truncheons deep into the soil, coupled with a lack of root growth along the intact stem, means that these plants are water deprived. This will dramatically slow growth, and may be a large part of the reason for the observed high levels of mortality. Below is a small plant that looked to have broken off a larger plant and was sitting on the soil surface. Check out those roots. Why are there no roots along the buried stem? It appears that the stem needs to be damaged before roots can grow from it. Elephant browsing would readily provide extensive damage along the stem. 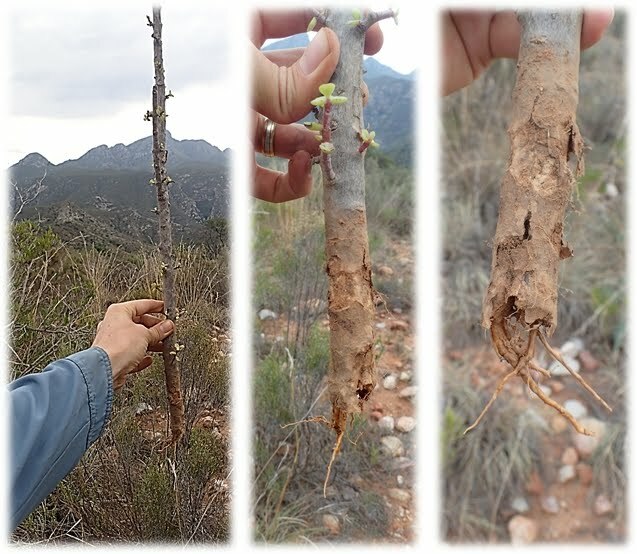 This is confirmed by observations of the spekboom 'skirt' (branches that creep along the ground from the main plant) growing inside and outside of herbivore exclusion areas. 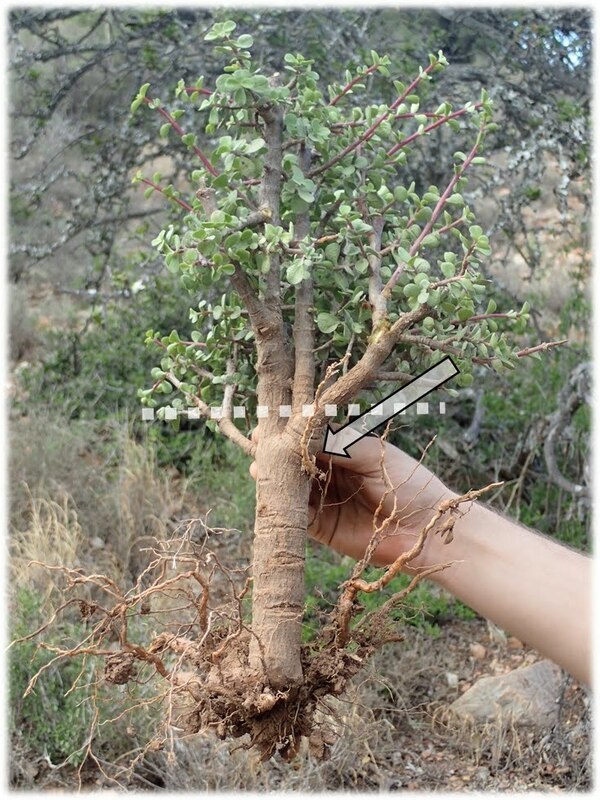 Outside the herbivore exclusion area, the skirt branches are usually well-rooted whereas there are very few rooting points inside the the exclusion area. Trampling over the skirt by animals causes damage to the bark and this in turn creates the rooting points. If using the planted truncheon root, then damage the part of the stem to be buried. We need to experiment which way would be best (e.g. horizontal cuts, lateral cuts, small cuts, long cuts, semi-crushed stem). Larger truncheons might not be the most optimal option. Many smaller cuttings, spread strategically across the landscape, possibly sitting on the soil surface, may be a better option. Strategic positioning is more important than a grid pattern. Almost always spekboom trucheons were planted away from potential nurse plants. Rather focus planting in the microhabitats where survival and growth is likely to be better. Update: Bruce Taplin emailed to add that he has observed major fungus infections on cut sections of underground stem leading to mortality after a wet period. This suggests that truncheons are also exposed to underground pathogens when the soils become waterlogged after continuous rainfall events. This may not be the case when root growth is established from the surface.